Another OOTD for you today, and this time it’s an easy outfit that I based around my brand new bargainous Primark shirt. 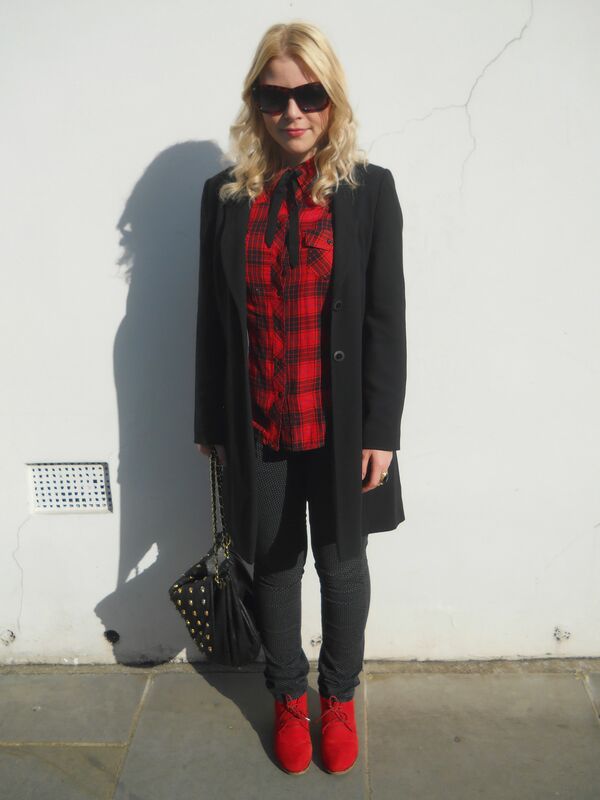 Check and tartan are really big for this season, particularly when worn in a more punky or grungy style. I decided I needed a versatile piece like this shirt in my wardrobe, and on spotting this one for only £9 in Primark, I had to snap it up. I love the bow detail on this piece as it really adds another element to the shirt and eradicates the necessity for some sort of necklace if you don’t want to have to think about it. Here’s how I styled one of this season’s must-have pieces. Being as the weather’s cooled down substantially, I opted for my ever-faithful black vintage coat which is almost like an oversized blazer. Coats like these are easy to throw over and look more effortless than more structured coats which can detract from prints or the focus of the outfit. To keep the colours fitting with the shirt, I chose black skinny jeans as well as red boots to really pull the look together. The jeans are from Matalan and are extremely comfortable, while the boots are from Timeless and give just enough heel for day without compromising on comfort either. My Max C London skull bag adds just enough edge and I think altogether the look is simple to throw on and simple to replicate with existing items in your wardrobe. Sticking with two colours really help to pull it all together, so pick out the shades in your shirt to really add punch with the rest of your outfit.